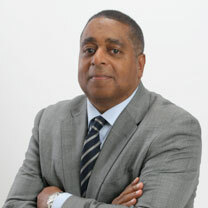 Melvin Greer is Chief Data Scientist, Americas, Intel Corporation. He is responsible for building Intel’s data science platform through graph analytics, machine learning and cognitive computing to accelerate transformation of data into a strategic asset for Public Sector and commercial enterprises. His systems and software engineering experience has resulted in patented inventions in Cloud Computing, Synthetic Biology and IoT Bio-sensors for edge analytics. He functions as a principal investigator in advanced research studies, including Nanotechnology, Additive Manufacturing and Gamification. He significantly advances the body of knowledge in basic research and critical, highly advanced engineering and scientific disciplines. Mr. Greeris a member of the American Association for the Advancement of Science (AAAS) and U.S. National Academy of Science, Engineering and Medicine, GUIRR. Mr. Greer has been named a 2018 AI Executive of the Year by Washington Executive. He has been awarded the 2017 BDPA Lifetime Achievement Award and the 2012 BEYA Technologist of the Year Award, which recognize his outstanding technical contribution and technical products that have a broad impact and high value to society as a whole. Melvin Greer has been appointed Fellow of the National Cybersecurity Institute where he assists government, industry, military, and academic sectors meet the challenges in cyber security policy, technology and education. Melvin is Professor, Master of Science in Data Science program at Southern Methodist University (SMU) and Adjunct Faculty, Advanced Academic Program at Johns Hopkins University, where he teaches the Masters of Science course “Practical Applications of Artificial Intelligence”. In addition to his professional and investment roles, he is Founder and Managing Director of the Greer Institute for Leadership and Innovation, focused on research and deployment of a 21st Century Leadership Model. Mr. Greer is a frequent speaker at conferences and universities and is an accomplished author; his fifth book “Practical Cloud Security a Cross Industry View” is his most recently published book. Melvin is a Board of Trustee at Capitol Technology University where he oversees and aligns its strategic direction, educational policy, finances and operations with the mission of the university. As a popular educator and board member at a number of Historical Black Colleges and Universities, Greer is leading science, technology, mathematical and engineering (STEM) research initiatives, directly trying to shape a more diverse generation of up-and-coming technical talent. Greer received his Bachelor of Science degree in Computer Information Systems and Technology and his Master of Science in Information Systems from American University, Wash. D.C. He also completed the Executive Leadership Program at the Cornell University, Johnson Graduate School and the Entrepreneurial Finance program at MIT Sloan School of Management.